A boater's or beach goer's delight. 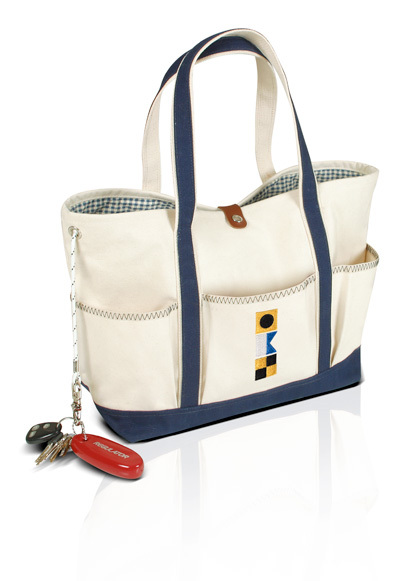 Nautically styled large tote fitted with 6 gusseted outside pockets to hold all sorts of tools, accessories, lotions, or personal items. Zig-zag sail stitching accents the pocket hems Inside is a handy slip pocket for cell phone or other small items. We've added a secured length of yacht cord fitted with a nickel snap hook for keys. The heavy duck tote is lined with gingham for a clean, finished interior. The bottom and straps are covered in another thickness of 18 ounce duck. The top opening can be closed with a handy leather latch.